Meantime, in spite of the raids, Jean Lafitte came and went between New Orleans and Barataria at pleasure. The government officials often learned when he was in town. Appeals made by honest merchants for the suppression of the gang that undermined their trade went unheeded until 1814, and then, when an indictment was drawn by the United States district attorney, it was so defective that conviction was found to be impossible—a fact from which suspicious people might draw inferences. 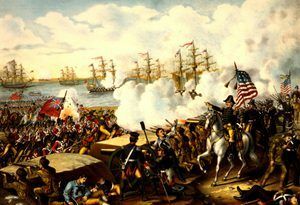 During the War of 1812, when the British came to attack New Orleans in the latter part of the year 1814, they sought Lafitte’s help, offering him a captain’s commission, with abundant lands and a free pardon for the capture of all ships that had been taken under the British flag. But Lafitte and his men hated the British and loved New Orleans. An American expedition was even then fitting out under Commodore Patterson to destroy the Barataria resort, and Lafitte knew all about it, but he refused to join the invaders. On September 16, 1814, Patterson’s force destroyed Barataria. capturing ten cruisers belonging to the pirates and one prize that they had brought in, with property worth not far from $150,000. The Baratarians had to flee to the swamps; but from his hiding place Jean Lafitte appealed for permission to fight under Andrew Jackson, and he paid Edward Livingston and the United States district attorney, John K. Grimes, then the most influential men in New Orleans, no less than $35,000 apiece to advocate his cause. The two succeeded in obtaining Jackson’s favor for him, and Lafitte was in the Battle of New Orleans, though what he actually did there has never been recorded. And under the date of February 6, 1815, President James Madison granted “a full and free pardon ” to all the pirate horde. Nevertheless, Lafitte’s career was not yet half ended. For two years after his pardon, there is but scant record of his doings. It is known that he did a little business in the old way at Barataria, but he did not get fairly afloat again until 1817. In the autumn of 1816 a piratical leader named Louis D’Aury, from the insurgent hosts of Spanish America went to the island where Galveston, Texas, now stands, and in a small way created there a resort similar to Lafitte’s at Barataria. The cruisers which, under various Spanish American flags, were ravaging the seas, needed a port where they might refit and dispose of cargoes—particularly slaves— that could not be sold openly. D’Aury’s name is worth recording because he was the originator of a most remarkable “bluff.” With a few hundred men, and enough lumber and tents to build shelters for them on a barren beach, he lauded on Galveston Island and established what he called the capital of the independent nation of Texas. He had conquered Texas from the Spanish, he said, and he organized a new government thereby issuing a proclamation. His government had two departments—an executive, at the head of which was D’Aury, and a judicial department, or court of admiralty. D’Aury supposed that vessels condemned by this court would be admitted, with their cargoes, to the ports of the United States, as were lawfully condemned prizes from actual nations; but he was of fickle mind, and in April of the following year (1817) he abandoned his island capital to find another location. To D’Aury’s abandoned capital, a tumble down collection of shanties, came Jean Lafitte; and on this Texas sandbar he founded a greater pirate colony than Barataria Bay. The Spanish American insurgent leaders had given cover to the pirates of the West Indies by issuing a commission to cruise against Spanish commerce to every ship captain that applied for one. These commissions proved to be efficient neck protectors; even the Spanish did not often hang the crew of a captured privateer that had such a document. But, when the cruisers wished to dispose of their prizes, the only market worthwhile was a port of the United States, and that was a market where their commissions and their traffic were scrutinized with steadily increasing severity. To reach the American market without undergoing this scrutiny, many piratical cruisers headed for Galveston harbor, where they were received as of old at Barataria. The distance to the plantations where slaves could be sold was longer, but the journey was made by boats through bayous where the revenue officers never came to molest the smugglers. Moreover, Lafitte bought cheap and charged exceedingly attractive prices. To Colonel James Bowie, the inventor of the famous knife, slaves were sold at one dollar a pound or an average of a hundred and forty dollars each; and Bowie, to get them on the market, took them openly to New Orleans, where he had them seized by the officials and sold as a lot at auction. At these auctions, no competitors appeared, and Bowie bought them at prices that enabled him to clear fifty thousand dollars in a year or two. There is but scant record of fighting in the story of Lafitte. On one occasion he learned that the crew of one of his ships had planned a mutiny. He allowed them to go ahead unmolested until at midnight they charged on the cabin. Then he gave them a reception that stretched six of them dead on the deck and wounded several more. One of his captains challenged him to fight a duel, after a dispute over the ownership of a box of gold watches. Jean accepted, and they went to Bolivar Island to fight; but when they had landed on the beach, the look on the face of Lafitte so cowed the captain that he fell on his knees and begged for mercy; whereat Jean cuffed and kicked him and let him go. But, beginning in 1819 one after another of Lafitte’s cruisers was captured while engaged in open piracy; some of the crews were hanged under sentence of the United States courts, and in the spring of 1821 the famous little Yankee warship Enterprise went to Galveston and compelled him to leave. It is a notable fact that while men from his cruisers were hanged he was not even arrested. He gathered his plunder into a beautiful brig called the Pride, a vessel of 14 good guns, well manned, and on an unnamed day, he sailed away, headed to the southeast. And there authentic accounts of Jean Lafitte come to an end. Some say he perished in Yucatan, some that he died in France, and one writer says that he met his end fighting an American warship off the south coast of Cuba. But whatever his fate, his career was the most remarkable known in the annals of piracy. Henry Morgan once gathered a larger force, but that was in the 17th century, while Lafitte did his work in the 19th. Morgan was able to hold his horde together for one assault only, while Lafitte held from 500 to a 1000 men from 1810 to 1821. It was a band of desperadoes gathered from the slums and prisons of all civilized nations and from the coasts of heathendom. They were men without a country, without a conscience or a hope beyond the gratification of appetite. They knew well the exhilaration that comes to wild souls in deadly conflicts. Mutiny—the defiance of law and authority—was the chief feature of their chosen occupation; but Jean Lafitte ruled them. They called’ him “the old man” when they talked of him, and when they addressed him they called him “bosse” (meaning literally prominence), and so added a word to the American language. He rarely associated with his followers, and seldom smiled. “When roused he could be desperate indeed,” says a historian, but his men were his friends as well as his followers. Moreover, during a period of 11 years, he was able not only to influence the authorities of Louisiana in his favor but to shield himself from the attacks of the Federal government. Lafitte was a pirate, and was guilty of the blood that his men shed, as well as of the blood that he shed with his own hands; but he was by no means wholly devoid of the qualities which go to the making of a hero. By John R. Spears, Munsey’s Magazine, Volume 28, Frank A. Munsey Company, 1903.